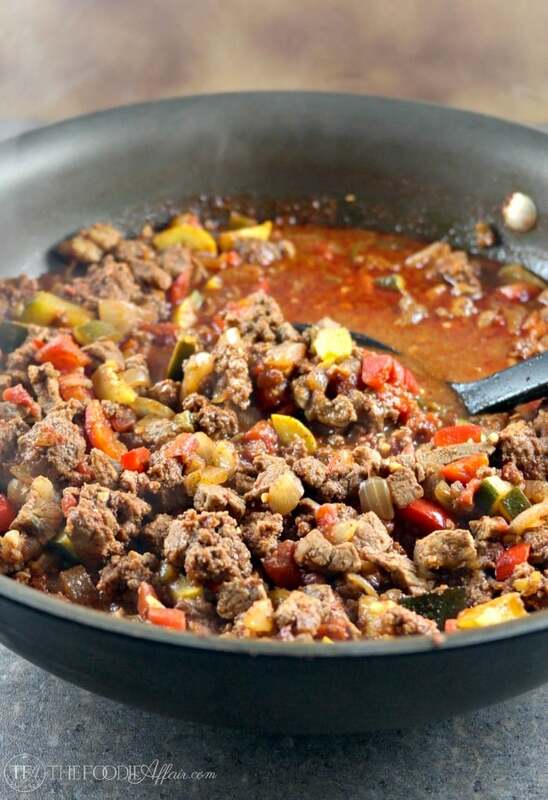 Chili Con Carne is a spicy stew with two types of meat and plenty of zucchini! Serve this with additional toppings like sour cream, Greek yogurt, cheese or diced avocado! 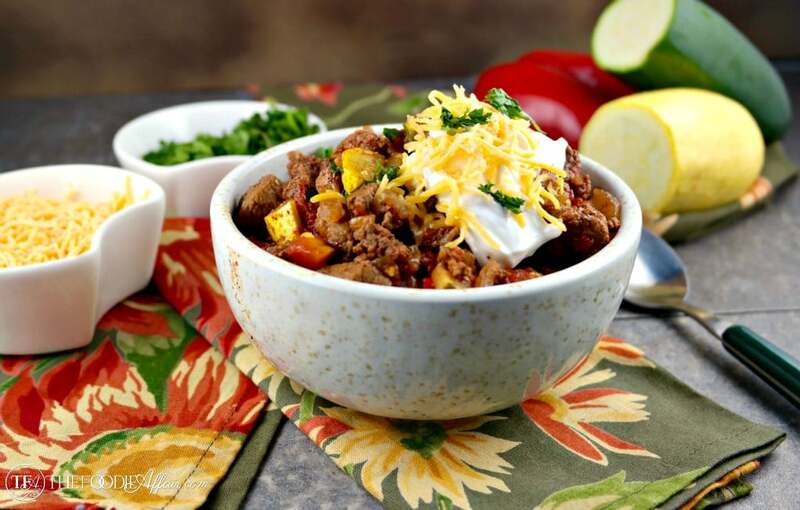 Chili con carne is a Paleo-style diet dream come true! 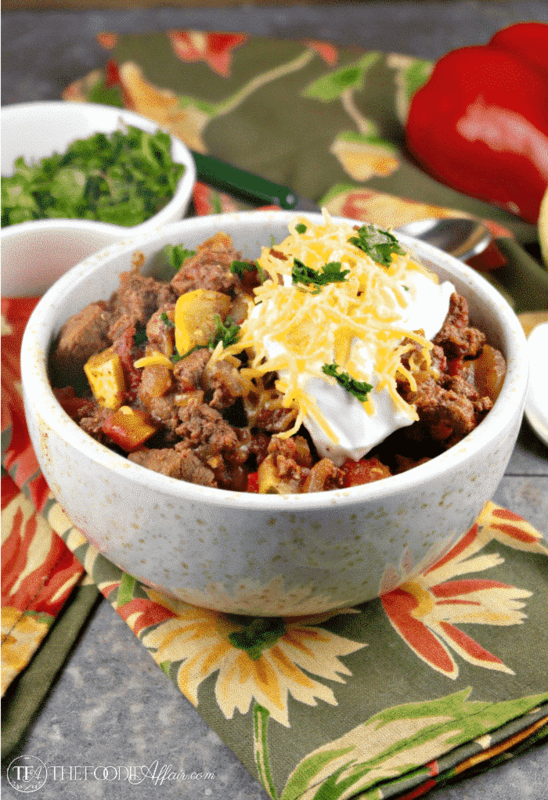 This dish has a lot of hearty beef that’s packed with flavor! There is no doubt that a serving of this chili will keep you filled for hours. To ensure this dish provided enough substance to stand on its own I used two types of beef; ground beef and diced chuck roast as well as several veggies. Cavemen gathered vegetables too, right? I can never pass up the opportunity to add zucchini to my stews and chilis so I added both diced green and yellow zucchini as well as some red bell pepper. Plus, the only thing I hid from my kids when they were little was chocolate. I couldn’t fool them though – ever! They were too inquisitive and if they sensed some trickery on my part they would call me out on it! Even to this day they have always scoped out the hidden treats. I’ll have to ask them if they have ick memories or certain foods. Every kid has them, right? Alan on the other hand scooped his portion over rice, and for another meal he had it on top of a baked potato. If I could stretch it a couple of more meals I would have made chili dogs with the remaining chili! Adding some sour cream, shredded cheese and diced avocados are some of my favorite toppings. It seems to cool down the flavors a bit. Fresh cilantro is the extra punch of flavor that rounds off this meal nicely. 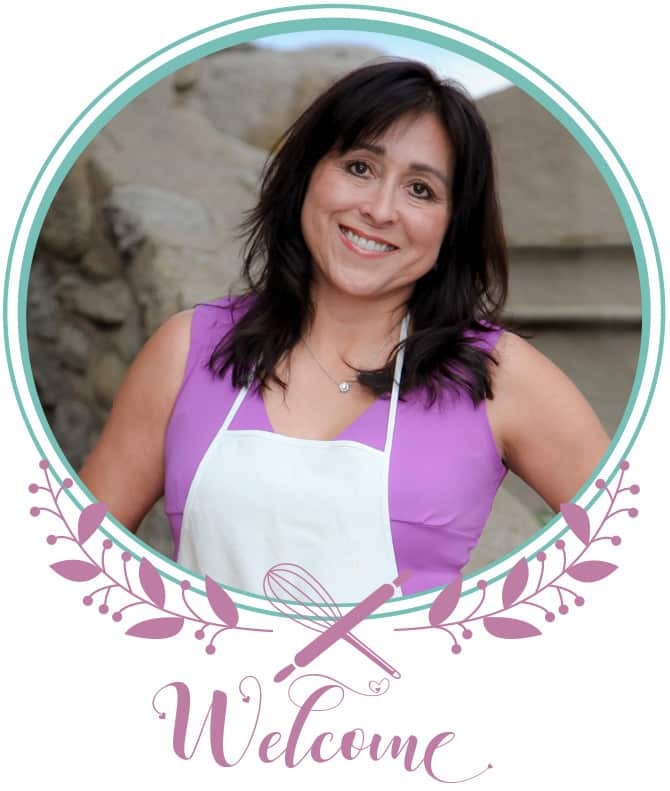 Want some more chili recipes? How about trying this vegetarian chili or Chili with Beer! In a large skillet heat oil on medium-high. Add the ground beef and break up with spoon. As it is cooking add the chuck roast. Drain any water/grease from the meat and then add the onion and continue to cook until translucent. Add the red pepper and vegetables. Stir in the spices: garlic, chili powder, paprika, cumin, salt, pepper until all the ingredients are well coated. Add the diced tomatoes, tomato paste, and beef broth. When the stew begins to reach a slight boil reduce the heat to simmer. Cover and cook for 30 minutes. 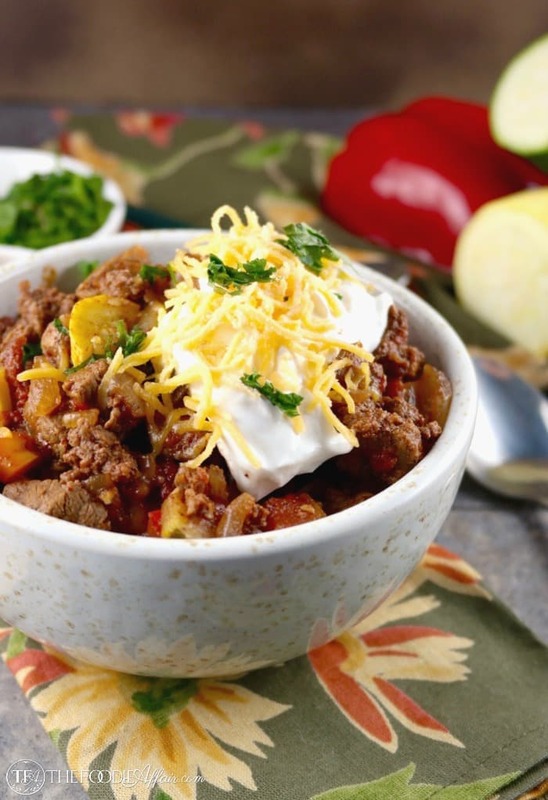 Chili is one of my favorites, and this recipe looks like it would be delicious! This is perfect especially now that the weather has chilled out a bit! Yes! This is one of those meals that warms your belly for sure! 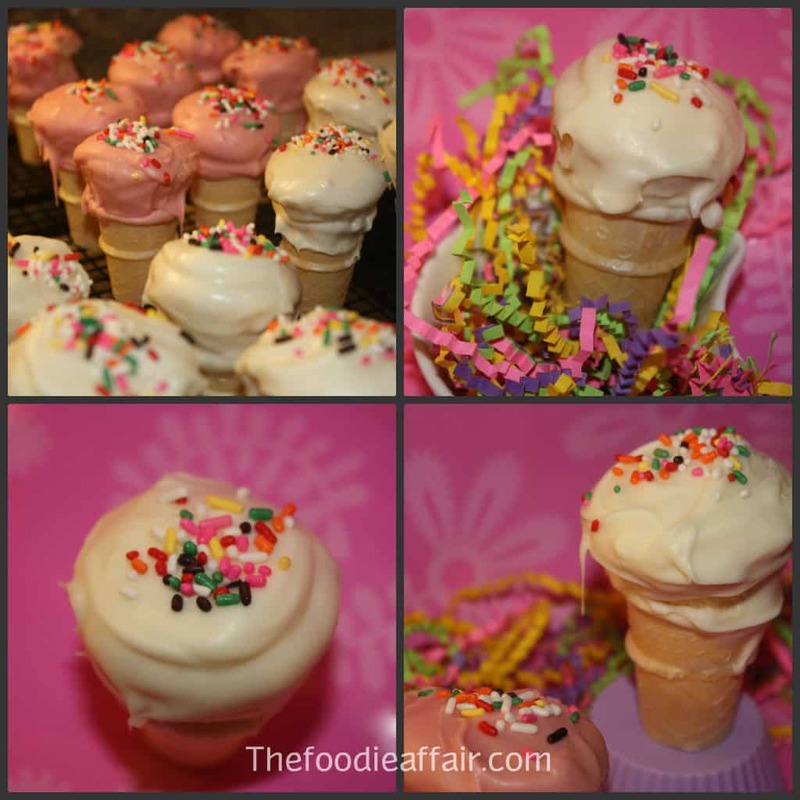 I love the versatility of this recipe and think you are brilliant for adding the zucchini!! Thank you, Betsy! I’m so hooked on zucchini and can never eat enough of it. I totally want this now. 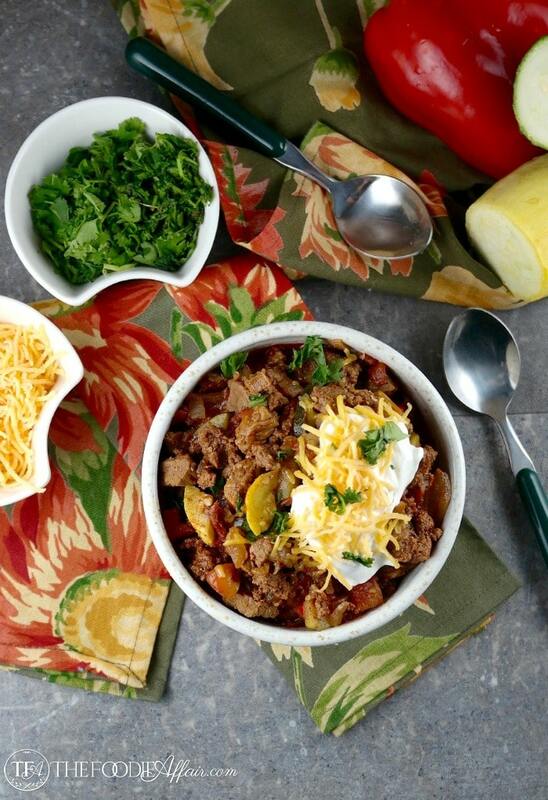 You can never go wrong with a delicious chili! Always a never-out-of-style classic! This looks delicious Sandra. I like to add a like sweet potato and mushroom to my chili. I’ll have to add some squash in their next time and get the kids to eat more veggies. Super hearty with great veggies. Can’t get better than that!